Move over, Rory: Tour rookie Cameron Champ averaged well over 300 yards off the tee on the Web.com Tour. Each year 50 golfers earn their PGA Tour card through the Web.Com tour regular season and Q school. Below are the five players we feel are most likely to have a major impact on the PGA Tour this season. For more analysis on the new 50-man class, check out my site, tourlevelfantasy.com. (Note all stats listed here are from the Web.com 2017-2018 season.) 1. Sam Burns Hometown: Shreveport, Louisiana College: LSU Age: 22 Cuts: 12/16 Top 10’s: 3 Top 25’s: 8 Wins: 1 Priority Ranking: 7th PGA Tour Experience: Made the cut 8/11 times with 3 top 25’s a 1 top 10. Web.Com Tour Final Results: Cut–T35–W/D–Cut Other Notes: Burns led the Web.com last year in birdie or better percentage (aka, BOB), and ranked second in his all-around* game – a combination of several stats that are similar to the PGA Tour’s strokes gained, tee-to-green. There are several talented golfers in this year’s class, but I don’t think any will be as successful as Burns. When we look to build a profile, Burns uses length over accuracy off the tee, ranking 8th in driving while ranking 98th in accuracy. 2. Sungjae Im Hometown: Jeju, South Korea College: Korea National Sport University Age: 20 Cuts: 20/25 Top 10’s: 8 Top 25’s: 14 Wins: 2 Priority Ranking: 1st PGA Tour Experience: Missed cut at 2018 U.S. Open; 42nd at 2018 PGA Championship Web.Com Tour Final Results: 1-51-16-43 Other Notes: Im will be competing in the CJ Cup on his home course in a couple of weeks, so watch out for him there. Contrary to Burns, Im does his damage off of the tee with his consistency and accuracy, ranking 22nd in that stat last year. He also finished 9th in all-around ranking and 14th in BOB%. He racked up top 25s and made 80% of his cuts, which bodes well at the next level. Get used to this name. 3. 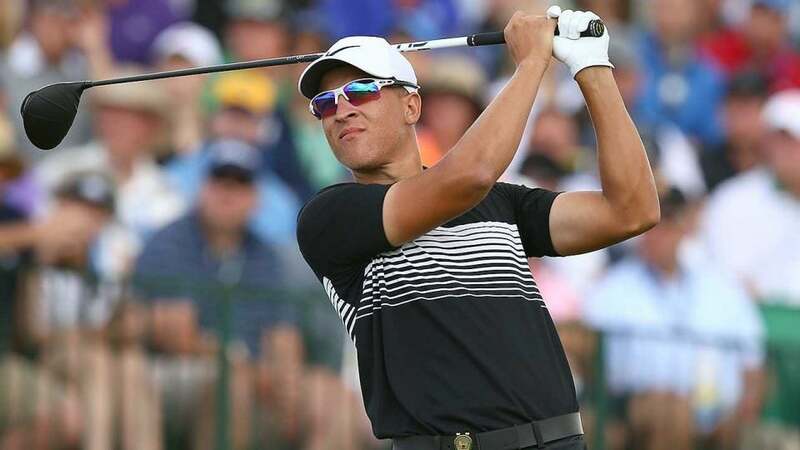 Cameron Champ Hometown: Sacramento California College: Texas A&M Age: 23 Cuts: 16/21 Top 10’s: 5 Top 25’s: 10 Wins: 1 PGA Tour Experience (2016-Current): 1/5 cuts made; 73rd at the Valero Texas Open. Web.Com Tour Final Results: 30/16/33/CUT Other Notes: Champ dominates golf courses with his elite driving ability, which will rival the best of the best on the PGA Tour. He led the Web Tour last year ranking in driving distance while also performing well in accuracy (37th). Not surprisingly, that added up to a lot of birdie chances, and he ranked 7th in BOB%. Not only is he great off the tee, he’s also steady with his irons, ranking 5th in GIR and second in ball striking. Add it up, and it all led to 4th in the all-around ranking. Champ has superb talent, and just needs to get acclimating to life at the next level. Watch out. 4. Cameron Davis Hometown: Sydney, Australia Age: 23 Cuts: 9/15 Top 10’s: 4 Top 25’s: 8 Wins: 1 Priority Ranking: 10th PGA Tour Experience: 2/4 cuts made, finished 38th and 58th in two events. Web.Com Tour Final Results: 3/16/Cut/3 Other Notes: One of two graduates from Australia in this year’s class (along with Curtis Luck), Davis is an exceptional talent. Like Champ, driving distance is his calling card, as Davis ranked 7th last season in 15 starts. He also ranked 6th in ball striking, 7th in BOB% and 4th in all-around. With a few PGA Tour starts already under his belt, Davis should enter this season with confidence. It won’t take long to see this guy’s name up on the first page of the leaderboard. 5. Anders Albertson Hometown: Houston, Texas College: Georgia Tech Age: 25 Cuts: 20/23 Top 10’s: 4 Top 25’s: 14 Wins: 1 Priority Ranking: 5th PGA Tour Experience: MDF’d at the 2017 RSM Classic Web.Com Tour Final Results: 9/21/2/31 Other Notes: Albertson relies more accuracy (55th) than distance (87th). He creates his chances with solid approaches (21st in GIR) while ranking third in birdie or better percentage. So, he’s either an elite putter or he’s hitting it pretty close. Time will tell once we see his date on the PGA Tour.